Edition of 15 featuring letterpress printing techniques, pressure printing, linoleum prints, and metal type. 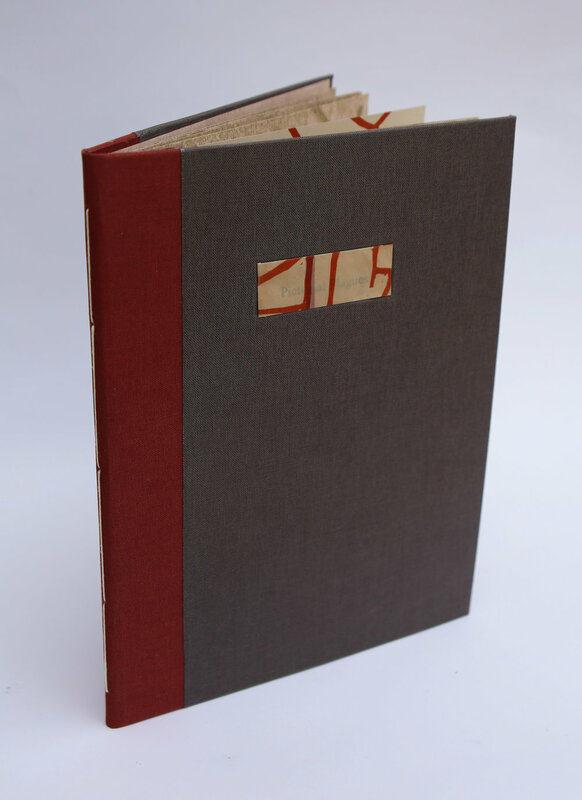 Pictorial Plagues also contains handmade translucent flax paper and text written by the artist. This book examines the fragility of memory, reflecting on how our understanding of people and experiences fades over time and we gradually require artificial prompting to remember, such as photographs. This book is a one signature pamphlet stitch featuring letterpress printed poems, written by the artist, that explore themes of nostalgia, memory, and loss. The title of each poem is an address and the monotypes are tracings of maps of those addresses. These maps have been overlaid with dirt collagraphs thereby burying each locale. Stagnant and Scarred are a diptych and the two books present complementing narratives about loss and the aftermath of grief. Handmade poplar box that houses Stagnant and Scarred. 24 collagraph prints on Stonehenge paper, Drumleaf binding with a break-away spine; 5 3/4" x 7 3/8" x 1 1/2"
Stagnant features the same pattern as Coalesce, but provides an alternative experience in physical interaction. Due to the way it is bound prints are seen individually, as opposed to the accoridion structure where the pages are continuous. Inked canvas embossments printed on Stonehenge paper; 6 7/8" x 5 3/4" x 3/8"
Scarred provides the context for Stagnant's narrative through the inclusion of text. This text focuses on the complications of living in the aftermath of grief.